Exercise is vital with r egard to relaxation. The majority of modern lifestyles are not active enough to keep mind and body healthy without extra physical activity. Exercise aimed at increasing cardiovascular fitness raises both blood-flow to muscles and perspiration through the skin, allowing the release of waste products and toxins. It is easier to properly relax a muscle after it has been contracted, and this is also because we have brought our attention to it. Exercise where the whole joint is used is very important, when it comes to the range of movement in the joints the “use it or lose it” maxim applies. Exercise which concetrates on mobilisation and strength of muscles over a long arc are especially beneficial. Yoga is emphasised in this way, designed as it is to relax the body in preparation for meditation, using focused breathing to bring the mind’s attention to parts of the body, releasing tension. Stretching as an activity has mixed evidence. It is often said that humans are the only animal that does not stretch after waking, something that polar bears do even whilst hibernating. Our natural urge to stretch, often accompanied by a yawn, after inactivity, is very beneficial to releasing muscles, and it is a sign that we are often out of touch with our bodies that we often ignore it. However stretching as a word invokes a sense of pulling a muscle beyond what is comfortable, and there is much debate as to whether this is efficacious. Certainly mobilising joints and releasing muscles as dicussed above are worthwhile persuits, but stretching muscles too far is unlikely to do any good, and can cause damage, which will cause tissue to shorten, thus defeating the object. Bouncing into stretches should especially be avoided, as should stretching cold muscles. As a general rule, one should mobilise (i.e. gently move joints to their full extent in a circular motion), warm up (i.e. running for around 8mins), gentle stretching coming in and out slowly, with focused breathing (i.e. hamstrings) and then a total relaxation (i.e. lying on one’s back). Posture is integral to keeping relaxed, again through mental attention. Our bodies are dynamic, and our posture is either improving or worsening, once we bring our concentration to bear on posture, it improves. For instance remembering to let our shoulders fall away from our ears and be slightly pulled back and down is something most people have to remind themselves to do regularly, but eventually it becomes second nature. In this way posture is like any other exercise activity, it takes practice. What makes posture so powerful is that it is something we can work on all the time. Often what we need to begin this practice is some advice as to what we are aiming for. Many people suffer through lack of sleep, and this both affects, and is affected by our ability to relax. There are obviously universal factors around poor sleep; eating late, alcohol, stimulants such as caffeine, stress and lack of exercise. 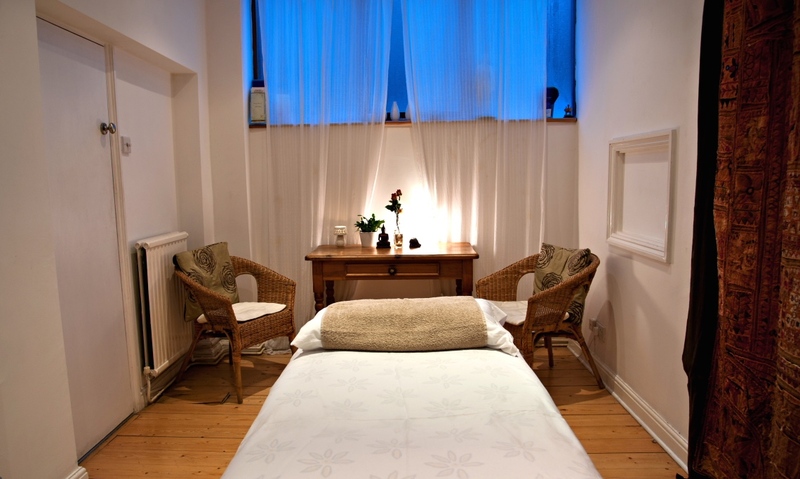 At London Family Chiropratic we have found treatment is extremely effective in helping people who have been unable to sleep properly, addressing physical discomfort and issues of relaxation. Relaxation is improved by addressing many of the issues mentioned above, as well as directly by the employment of soft tissue and fascial techniques on muscle and surrounding tissue. In addition chiropractic treatment affects the autonomic nervous system to lessen adrenal stimulus and to promote the homeostatic mechanism, (the body’s restorative function) which will allow a tense, exhausted person to get much-needed sleep. All the factors and techniques discussed here are concerned with bringing attention from the mind to the body, and in many ways this chimes with the practice of meditation. Meditative practice and mindfulness aim to discard distracting thoughts and anxieties thereby increasing awareness to the present moment. Meditation allows relaxation and thereby has physiological effects, such as reduction of blood pressure. Older people may have more difficulty relaxing whilst receiving bodywork treatment, partly this is generational, as older people are often less familiar with this kind of contact, and partly because they may be less active, especially over a long range of joint movement, and their muscles have becomed shortened and tight.Increasingly, as a chiropractor I have found that in order to achieve optimum results, the whole aspect of relaxation must be addressed, both inside and outside of the clinic room. In order to do this we have to consider and make our clients aware of breathing practice, exercise types, stretching strategies, postural advice, sleep factors and mindfulness. For more information about Ben’s work as a Chiropractor at Graceland’s Yard, please follow this link.